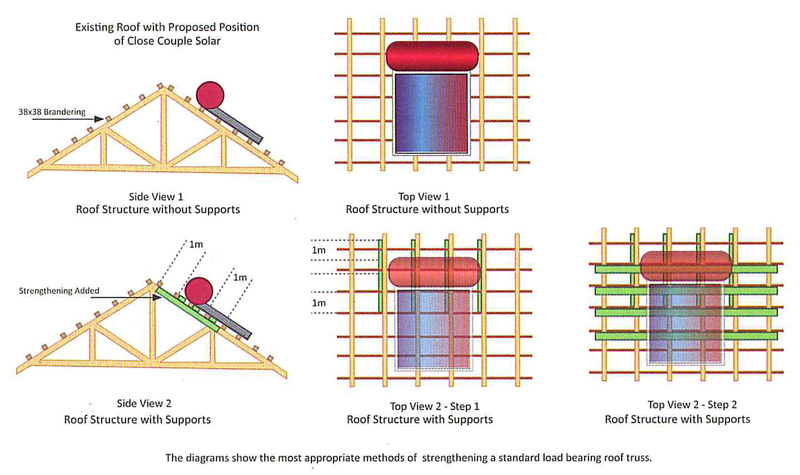 When strengthening a roof structure for a solar geyser system, the objective is to spread the additional load over the widest roof area possible. The size of the timber used, should mirror that which is in the existing roof structure (usually structural timber, such as pine, measuring: 114x38mm – SABS approved). In no way should the existing roof structure or parts thereof be removed, cut away or into. If applicable, this timber must be secured to the underside of the 38x38mm brandering; otherwise, the roof tile will not fit back in place. As with the strengthening of rafters the perpendicular bracing needs to extend past either side of the solar HWC, to the first rafter after the solar HWC. For more complex situations or if you are in doubt, an expert should be consulted.